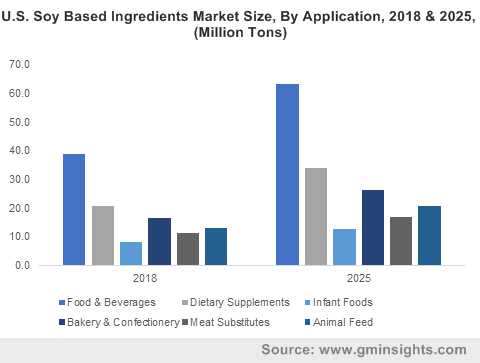 Plant Based Ingredients Market size was over USD 8 trillion in 2018 and industry expects consumption at over 4.5 billion tons by 2025. Growing consumer consciousness towards meat substitutes products is likely to stimulate plant-based ingredients market growth. Global meat substitutes market size surpassed over USD 4 billion in 2017, which indicates tremendous growth opportunities. The plant-based ingredients avert various chronic diseases like diabetes & obesity and provide high nutritional content to the body. These products are gaining popularity owing to the superior properties including sustainable nature, ease of digestibility and non-allergic nature, thereby driving the industry growth. Growing demand for dietary supplements owing to increasing importance of proteins among consumers will further stimulate the market growth. Global dietary supplements market was valued at over USD 96 billion in 2017 and may surpass USD 220 billion by 2025. Consumers prefer protein drinks & shakes manufactured from natural sources which contribute to general health and wellness, which may foster product demand. Rising demand for clean label trends and desire for a healthy lifestyle should promote plant-based ingredients market growth. Companies are now engaged in developing new innovations of food items to promote a healthy lifestyle. Plant based ingredients lower the cholesterol level, provide essential vitamins, minerals and amino acids required by the body and enhance the life span of consumers, thereby accelerating market demand. Soy protein one of the commonly used plant-based ingredients consist of a group of chemicals called oxalates which is the main cause of developing kidney stones. It is used as a genetically modified crop which increases the risk of allergic reactions and other health related diseases if they do not meet the food safety criteria. Consumption of this GMO crop can cause possible liver damage and other dangerous effects on human health and environment which might hinder the market growth. Global soy-based ingredients market size may witness gains close to 5.5% up to 2025. These are used as primary ingredients in the food industry and form a crucial part of global food chain. Increasing application trends in dietary supplements and growing demand of a vegan diet should further stimulate industry growth. Soy based ingredients market demand from food & beverage applications was valued at over USD 430 billion in 2018. Several manufacturers are increasing their beverage product portfolio by including soy milk and rice milk as dairy-free alternatives. Rising trend of vegan diets, ethical concern for animal exploitation and growing awareness for fats present in animal-based diets will boost the market size. Global wheat-based ingredients market size is likely to witness significant gains at over 6.5% by 2025 on account of growing adoption of healthy, nutrition rich and whole grain diet by consumers. Various manufacturers today are promoting products like high fibre biscuits and whole wheat bread owing to the rising health concerns. Wheat based ingredients market demand form dietary supplements application may witness gains at over 5% by 2025. These ingredients provide an essential role in maintenance and growth of body tissue. Furthermore, consumption of these products reduces the risk associated with heart disease, stroke, cancer and obesity, which further boost the market growth. Global canola-based ingredients market demand from bakery and confectionary applications may register significant growth at over 3% by the end of forecast timeframe. These products are used to produce lighter baked goods and provide vitamin E which act as an antioxidant that protects the human body’s fats and proteins from free radical damage. Furthermore, canola oil produces neutral flavour and gives light texture making it reliable for baking, thereby stimulating the plant-based ingredients market size. North America, driven by the Canada, Mexico, and the U.S. market size may surpass USD 3.5 trillion by 2025 owing to the growing awareness for diseases and healthy lifestyle. Growing awareness for health which have increased the demand of health clubs and fitness centres is likely to boost sports nutrition demand in the region. Companies are producing organic whole plant protein shakes, and meals which contain no sugar and provide the same taste which has led t increase in vegan trends and meat substitute products, further enhancing product demand. Europe market demand led by Germany, UK, France, Italy and Spain may register significant gains at over 6.5% in the forecast timeframe on account of increasing baked products demand. Technological advancements have made it feasible for manufacturers to focus on innovation of new baked products which comprise of whole wheat, gluten-free and sugar-free products. Increasing demand of low-fat, multigrain and organic baked products will stimulate regional plant-based ingredients market size. Asia Pacific driven by India, Japan and China market size may register gains at over 6% by the end of foreseeable time frame. China recorded a substantial increase in the meat substitute market in the region owing to the changing lifestyle and awareness of health concern related to animal-based meat protein. Shift in consumer preference towards natural plant proteins and rising meat prices will propel the plant-based ingredients market size in the region. 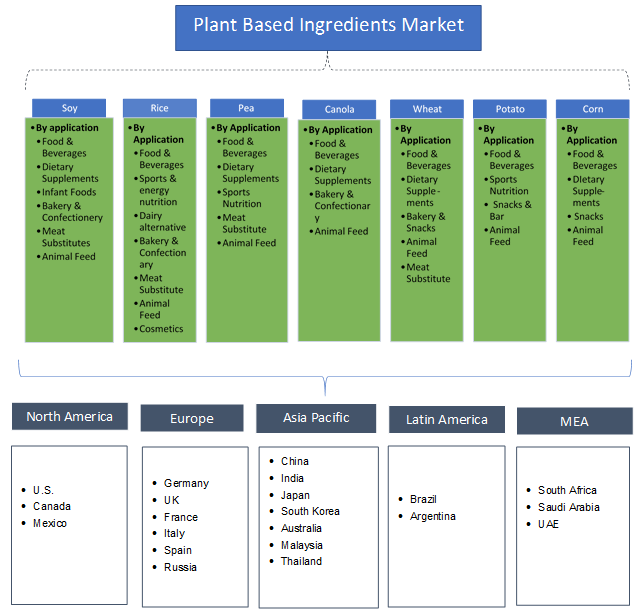 Global plant-based ingredients market share is competitive and fragmented among various market participants such as DuPont, Roquette, Cargill, Dohler Group, Health Warrior and Naturex. Most of the manufacturers are focusing on strategic collaborations and developing new product line to expand their product portfolio and attract new customers. Plant based ingredients have emerged as alternative high protein sources which has enforced manufacturers to experiment and develop high fibre, tasty and alternatives to meat. These are a high source of essential amino acids, minerals and vitamins which are required by the body to prevent dangerous diseases and promote a healthy lifestyle. Rising consumer awareness regarding artificial mixtures and chemical composition which may further prefer products containing natural plant sources are likely to stimulate plant based ingredients market growth.